Beloved British carmaker, Mini, is celebrating the 15 year anniversary of its brand revival. It was seven years after the BMW group purchased the rights for the Mini brand, that the first of the reborn models rolled off the production line, on April 26 2001. Tuesday this week marked a decade and a half exactly, and in that time the 'new Mini' has seen phenomenal success with in excess of 2.5 million vehicles sold in more than 110 countries around the world. 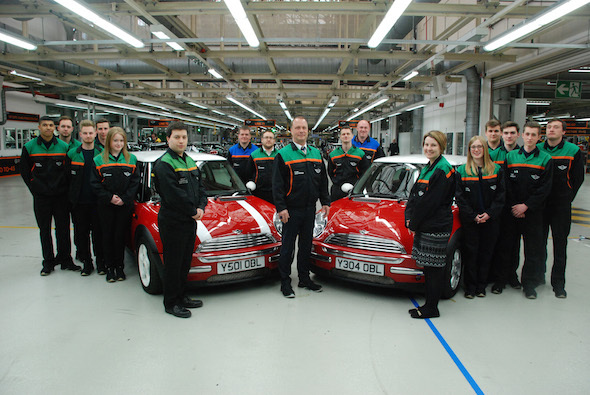 At its Oxford manufacturing facility – Plant Oxford, a workforce of 4,500 produce its flagship hatch, alongside its Clubman, Roadster and Coupe models. Roughly 1,000 cars roll off the production line every day. Commenting on the impressive number, plant manager Frank Bachmann said: "Building 1,000 individually configured premium automobiles every day is a big challenge, which our employees master thanks to their exceptional level of passion and skill." Meanwhile, Mini's Paceman and Countryman models are built under contract by Magna Steyr at a plant in Graz, Austria. The BMW-owned Mini brand has remained in touch with its provenance and seven years ago celebrated the 50-year anniversary of the British Motor Corporation launching the original Mini Cooper. Over the 2009 May bank holiday weekend, 15,000 Mini fans gathered at Silverstone for a three-day festival, and three special models were unveiled – a 211bhp World Championship 50 Edition plus high-spec Camden and Mayfair models.